Papersmart.net offers various kinds of academic papers to students. The company provides help to students who are having a hard time completing their academic writing. From high school essay to college essay, their team can work on their paper that comply with the school requirements and fits your academic level. Aside from their writing services, Papersmart.net are also known for their custom writing services. Whether you are asked to write a thesis, proposal, research paper and others the company can help you create high-quality paper. It is important that you give them clear instructions. Only the best and professional writers will work on your papers. 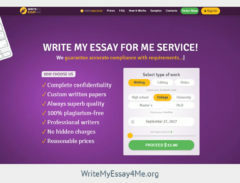 According to them, their essay service is different from the other writing services. Some writing service company would let a writer from another country to work on your paper. The Papersmart.net makes sure that only native and professional writers will work on your paper. They are focusing on quality rather than quantity. It only means that if you order from them, they don’t just fill up the pages with words. They make sure that everything their writer includes in the paper is of substance to provide well-written papers. Their writers are from the US, UK, Canada, and Australia. The company also subject the paper to plagiarism checker so you are assured that what you get are unique and original. The prices per page vary depending on the academic level and deadline. For example, if you place an order earlier you will be charged with a lower rate as compared to if you order a rush work. The lowest price is $12 per page with high school academic level and 14-day deadline. For the Ph.D. academic level with a 14-day deadline, you will be charged $27 per page. For rush order, it will cost you more than $27 depending on the type of content you requested. Some of the freebies Papersmart is offering are a free title page, free bibliography or reference pages, free revisions, and free formatting. Each page will have 275 words with 12-point Times New Roman or Arial font. In some instances, they will offer hot prices listed on their homepage, which is some sort of promotion to their clients. If you think $12 per page is a discount then so be it. They are also offering a discount program and you can be part of it. Once you become eligible you will get a lifetime discount. You can join this program once you spend a certain amount of money on your orders. It is a common procedure to most companies that want to encourage their clients to order from them again and again. There is no testimonial page on the site. A link is provided but upon checking the page is empty. The company claims that they have been on the market for 10 years. It is not usual for a company that is operating for many years now without published customer comments. To test the quality of their paper we order for an essay. The paper was not bad at all and the essay writer followed all the instructions given to her. But it is not as what we expect to have. It is not plagiarized. This only proves that they are not a scam. The company offers 24/7 customer service, for technical problems or if you have inquiries about the project, you can contact them thru their toll-free number and via live chat. By contacting them it is much easier for you to check on the progress of your paper. The company also offers a Money Back Guarantee where they offer a full refund if you are not satisfied with their work. If you need to talk to them about the project to inform them of a sudden change in instruction or additional information about your order, it is best to use the live chat. We haven’t tried calling them but we find the live chat more convenient. Papersmart.net is a legit company that offers writing services to students from high school to Ph. D. Although, they have a Money Back Guarantee we still are not recommending the site. One reason is that they do not offer better pricing policy. If you check out other writing service companies, their prices start at $9 which is $3 lower than Papersmart.net. Based on our experience, Papersmart.net can provide an average quality of the paper. We also cannot find any student reviews that is very important particularly for those who want to check on their service. They should try harder on improving their services and pricing.